These Ombré Flower Pots were on my list of projects for quite some time. They’re finally done and I love how they turned out! I’ve been spending lots of time outside, working on the garden. I finally have all my flower pots planted. These Ombré Flower Pots were on my list of projects for quite some time. They are miss matched pots, of the foam variety which are great for our tough climate. They started out looking like this, one green and one brown. One was a gift, the other came from a pile of trash. There is no better way to marry two odd ball items than by painting them both the same. My paint choice for this project is Krylons High Gloss Spray Paint. It holds up well to the outside elements and works great on foam or plastic. This blue and green combo is so lushious for the garden, there is something captivating about blue and green together. The first step was to clean the pots with a spray bottle of water and a damp cloth to remove any dirt. Starting with the pot upside down, I sprayed the outside with the blue color. I used two coats, spraying lighter as I worked my way to the top (bottom). After it was dry, I turned the pot right side up, and sprayed with the blue inside the pot to a depth of 3″. Then I sprayed from the top down with the green paint, layering the color and letting the green fade towards the bottom to create the appearance of Ombré. I chose a variety of annuals for my pots. I always be sure to add enough holes for drainage, the foam pots easy to drill holes in with an electric drill. The best soil to use is one with a built in fertilizer, as constant watering will leach all the nutrients out of the soil and kill your plants. For this reason I prefer Miracle Grow, it feeds for 6 months without needing more fertilizer. I combined both herbs and annual flowers in these pots, including purple basil, kale, petunias, sage, fennel, and streptacarcus. I like to try out the placement of the plants before planting them. I am so pleased with how these turned out, I may do a couple more of them. 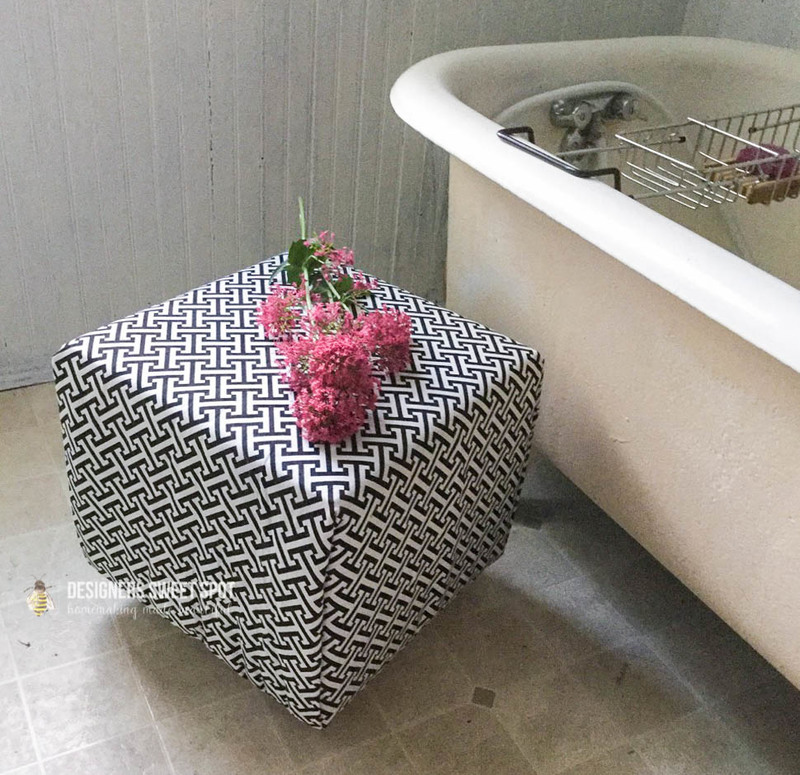 Subscribe to get the building plan for my MILK CRATE OTTOMAN.